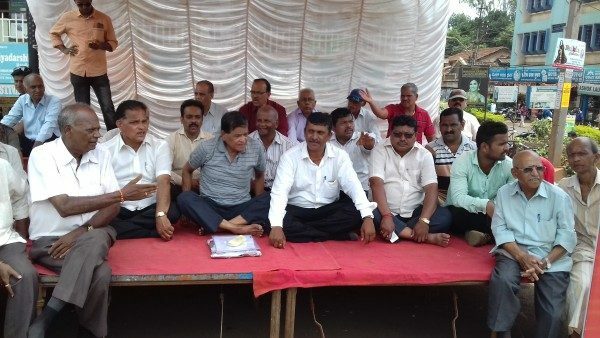 Vinayak Gunjatkar, Chairman of Standing Committee for Town Planning & City Improvements is protesting at RPD on the issue of removal of encroachment by Sanjay Patil’s Gomatesh Vidyapeeth. On may 12 he had met District incharge minister to look into the matter, but no one has been interested in removing this encroachment, he said. For road widening even boards on the shops were removed but here this is a comp0lete illegal structure then why it cant be removed or is the LAW different for the poor in this country. EE R S Naik, met Gunjatkar before the he began the protest saying as Commissioner is not in town he should wait to come back and he will take the decision on the same.